The UVM Sequence Tree View presents the call tree of an UVM sequence. The call tree is made of all sub-sequences that are triggered by the sequence, recursively down to leaf sequence items. or right click and choose Show > UVM Sequence Tree from the menu. The UVM Sequence Tree view is automatically raised and populated with the call tree of the selected sequence. At any time you can open the view from Window > Show View > Other... > DVT > UVM Sequence Tree. 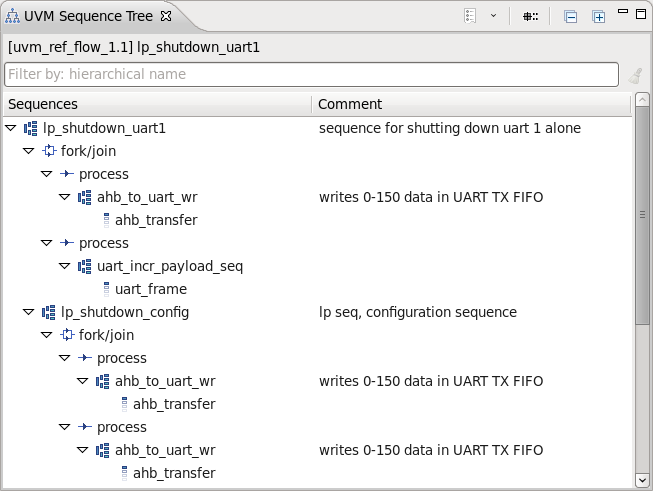 Show History List Click to see the previously inspected UVM sequence call trees. Prepend Package Name Prepend the enclosing package name to the name of each class. The view label shows the current project and the sequence for which the call tree is presented. A class that inherits from uvm_sequence. A sub-sequence may be called from an `uvm_do macro or started using the seq.start() function. A class that inherits from uvm_sequence_item. A fork/join block in the sequence body(). A process from a fork/join block. Show Usages (References) Search for the references of the selected sequence. More details here. Show Type Hierarchy Show the type hierarchy for the selected sequence. More details here. Show Verification Hierarchy Show the verification hierarchy for the selected sequence. More details here. Show UVM Sequence Tree Show the sequence tree for the selected sequence. Practically set the selected sequence as root. Show Diagram Show the diagram for the selected sequence. More details here. Copy Copy the selected sequence class name to clipboard.